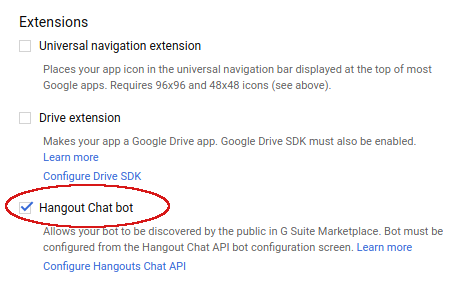 This guide tells you how to submit a Hangouts Chat bot to the G Suite Marketplace. Listing your bot this way lets any Hangouts Chat user add it to a space. As of this writing, when you publish your bot to G Suite Marketplace it does not appear among the apps listed there. However, it is still discoverable by users because it will appear in the autocomplete. 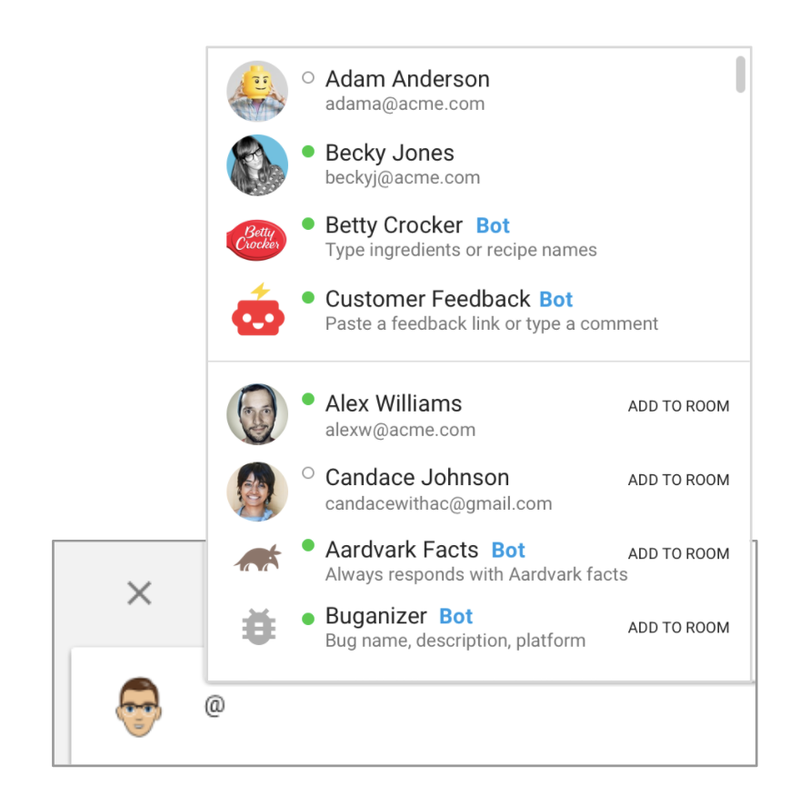 Expect to see bot listings added to the G Suite Marketplace user experience in the future. When you first start developing your bot, you should build and test locally, then expand your scope to include other users in your domain. The autocompletion when they start typing the bot name is how they discover the bot. Create an OAuth client ID, if your project doesn't already have one. Add the G Suite Marketplace SDK to your project and populate its configuration tab. Populate the SDK's publish tab and submit. The detailed steps for each of these are described in the following paragraphs. You may already have an OAuth client, especially if your bot accesses any Google service APIs. If not, you need to create it as described in this section. Open your project in the Google Cloud Console. Select Credentials then OAuth Consent screen and fill out the consent screen details (the consent screen is usually not displayed to Hangouts Chat users, but is a prerequisite anyway). On the Credentials tab, choose Create credentials > OAuth client ID, choosing Web application as the application type. Fill out the other OAuth configuration details, then click Create. Now that your project has an OAuth client ID, you can continue defining the G Suite Marketplace listing. Open the Google Cloud Console and choose the project you're using for the production version of your bot. Do not confuse this with the Google Apps Marketplace API, which is a different service. Select Hangouts Chat bot. This links your bot to the marketplace listing. The Test installation flow feature of G Suite Marketplace doesn't work for Hangouts Chat bots. Even though we don't require OAuth for profile and email scopes, you must create an OAuth client ID to even be able to fill in this page. 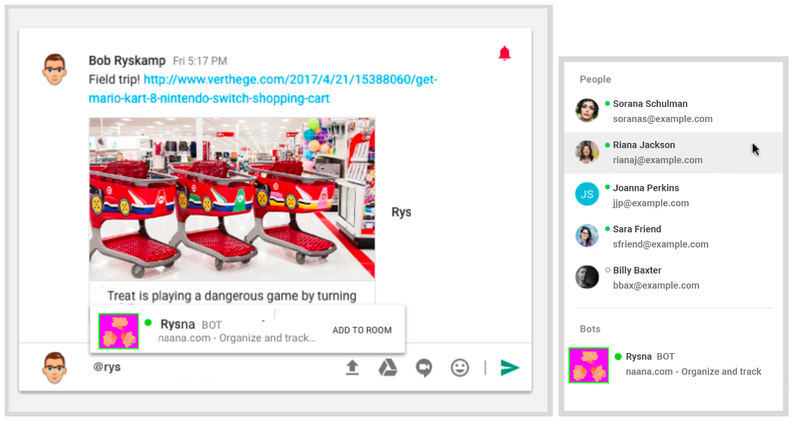 You can't bundle Hangouts Chat bots with other G Suite Marketplace listings. After you fill out the configuration tab, you next fill out the Publish tab. Add a detailed description, application banner, any number of screenshots, and choose a Category. Make sure that all your graphics assets (icon, application banner, and screenshots) are sized correctly. The next step will lock your configuration, and you will not be able to change it. Even simple name changes will no longer be possible. So make sure everything is ready before you go on to submit your project for review. The bot supports a ‘help’ command. It must verify that requests are coming from Google using verification token. The review process is automatic and is required for all public bots. Bots that you distribute only to your team or domain do not undergo review. When you complete the publication steps for a public bot, a request for bot review is automatically sent to the Google review team. A review team member then examines your bot and its listing to ensure it is designed well, follows the style guidelines, takes the appropriate steps to protect user data, and does not include any malicious code or unacceptable content. You should also send an email to chat-bot-review@google.com to ensure priority handling of your request. After the review team member makes their initial assessment, you will receive an email communicating whether your bot has been approved or if it requires additional work before it is publicly available. If your bot requires additional work, you will receive a review document containing specific information about what aspects of the bot need improvement. Address all highlighted issues and follow the provided instructions to resubmit your bot. Many developers are required to improve their bots prior to public release; some may be required to do this multiple times. You may always contact our review team for more information and guidance with this process. Once the review team's concerns are satisfied, you will be informed and your bot will become publicly discoverable.